If you're just tuning in, this week I'm going to be blogging about last week's beach trip with Grayson's extended family. Although in years past I'd blogged about each day while we were there, this year I had a request to spend less time on the laptop and more time visiting, a request I tried to honor. So! The recap begins today and will run all week. If you don't like the beach, come back next week! As has become our plan, we departed Birmingham Thursday night after work, picked up the kids at daycare and got on the road. We got to Conyers, Ga., around 10 p.m. that night, and we checked into our hotel. Although we'd reserved two adjoining rooms, as it turned out, our rooms were ADJACENT but not ADJOINING. Friday morning we bounced out of bed (and by "bounced out of bed," I mean that I staggered blindly around the room for an hour before the fog cleared), and we got on the road to South Carolina. In the interest of time, I'll quickly tell you that it took hours and hours and hours to get to my grandmother's house, where we spent three hours visiting with her, we then drove on to Myrtle Beach, enjoying several random fireworks shows through the windshield as we drove, we checked into our hotel around 10:30 p.m., where we had one room for six people, which I do not recommend in any way, and Amelia -- who has never slept in the room with any of us before -- was BESIDE HERSELF WITH THE GLORY THAT IS SLEEPING IN THE SAME ROOM WITH OTHER PEOPLE!, and if she could have stood up in her Pack-n-Play and jumped up and down, she would have, and finally around 1:00 we finally, finally fell asleep. So that was Friday. Which brings us to the day you found in the title of this post: Saturday. AREN'T YOU GLAD YOU READ MY BLOG? Where else can you read 500 words before you actually get to the part of the post that has to do with the post title? Not many other places, I'll have you know. You get what you pay for, Internet. Oh, and in that same vein, all of the pictures in this post were taken with my phone, since my camera was still packed. On SATURDAY, we got up and went next door to Hard Rock for lunch. I'd never been before, and it was pretty good, actually. 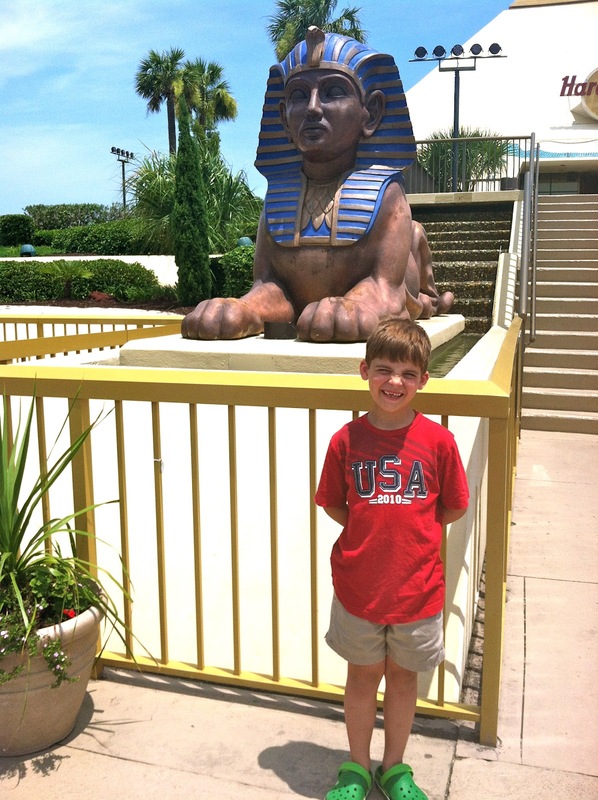 On the way out, Nick said, "Take a picture of me in front of the sphinx, Mommy!" Strange request, but, okay. We drove the remaining 90 minutes to our beach location in Ocean Isle, N.C. This was our first year there, after eight years in Garden City Beach. 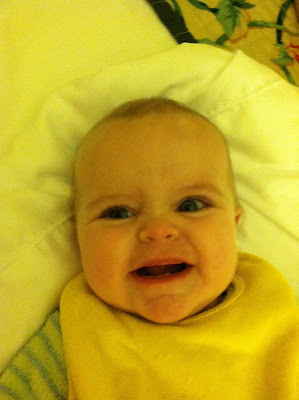 When we arrived, Rudy (Grayson's dad) held Amelia for me while I fixed a bottle for her. She wasn't sure about him at first, but she warmed up quickly. 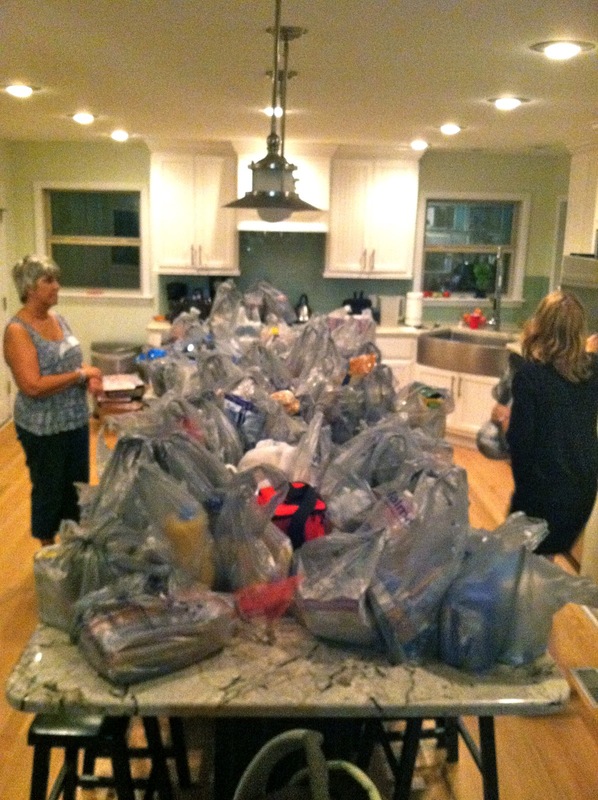 Once all the families had arrived and unloaded, we women departed for our annual grocery trip. We have quite a system set up in which we each take a couple of sections of the Master grocery list, and then we also shop for the items we need to make our own recipes for the week. My cart this night was about $310. 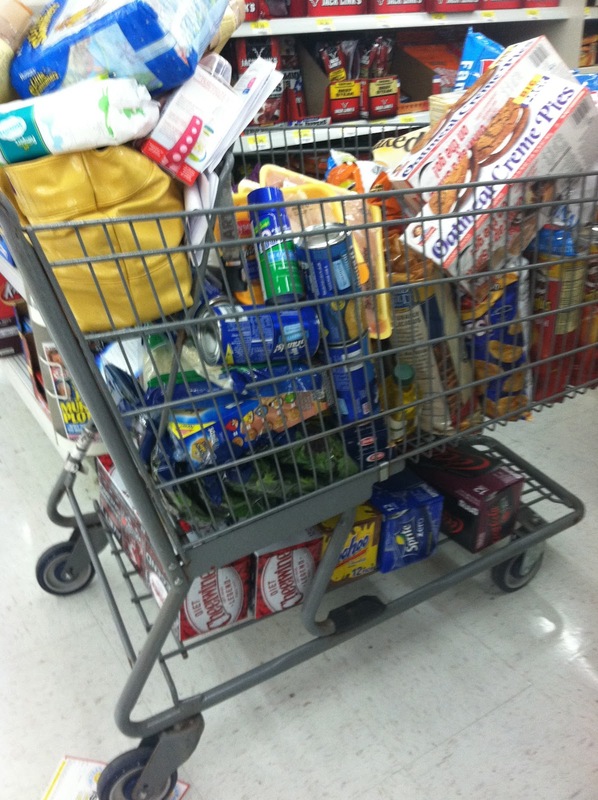 We always leave with six or seven full carts, and this is just the groceries. 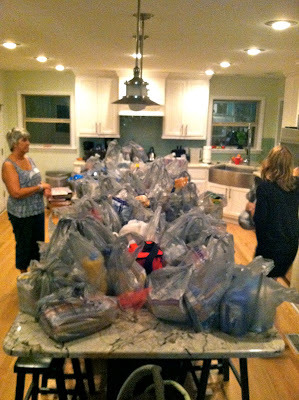 We get the paper and other bulk goods at Costco. Forty sticks of butter make up a nice pyramid, don't they? But let me tell you, Internet: WE ATE WELL. Mercy me, we ate well last week. Every dish was delicious, and I hope to be able to share the recipes with you. (We're working on collecting them now.) The week started off with a bang, and the good times continued for six days. And we made sure to obey the Cottage Rules posted in the kitchen.